MG University Fourth Allotment 2018 Results List – Check Mahatma Gandhi University UG 4th Allotment List released on July 12th at cap.mgu.ac.in. The Mahatma Gandhi University (MGU) announcee the Degree Fourth allotment results for the undergraduate courses. 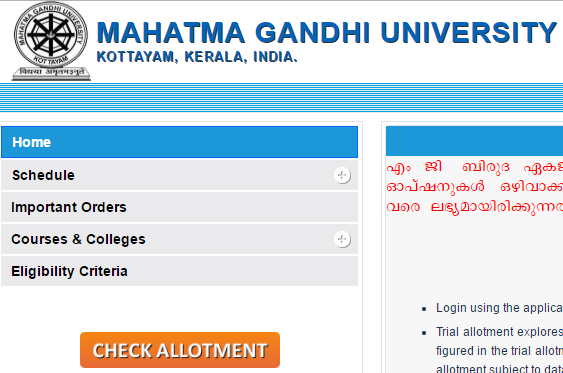 Students those have applied for the Degree courses in Mahatma Gandhi University can check the details from the MGU website through candidate login at mgu.ac.in. The University has reported that the UG 4th allotment result will be declared on 12th july. Hence candidates waiting to check the third allotment results can refer to the website for more info. The Second merit list is publishing by the University to make the students understand about their position and the colleges they can get as per the CAP system. The MGU is going to announce the 3rd seat allotment list on 5th July 2018. Meanwhile, aspirants can check the MGU UG allotment result 2018 and can wait for the final merit list. MGU Degree Fourth Allotment Results 2018: The Mahatma Gandhi University is one of the well-known universities in India. The University was established on 2nd Oct 1983 in Kerala. It offers the quality education as per approved standards of UGC and accredited by B+. More than 100 affiliated colleges are working under MGU. The admission will be given to students using the Centralised Allotment process (CAP). Under this system, students can apply for admission into multiple colleges, and multiple courses with a single application. The Mahatma Gandhi University has released the Revised notification for admission into Graduate Degree courses. Hopefuls seeking admission in MGU have applied through the MGU official website. All the hopefuls will be provided with the preferable list of colleges and courses in the allotment result. Once after they have checked with the MGU 4th allotment, students can alter their preferences using drag and drop method. The fourth seat allotment announced by the MGU on 12th july. Students can get admission into various UG courses in Govt/ Aid/ Self-financing affiliated colleges and self-financing programs in Aided Colleges that re-affiliated to MGU. The candidates can view their allotment status by logging into home page using their application number and password. Applicants who got fourth allotment should download “Allotment Memo” after remitting the fee due to University through the online payment gate way. Only those candidates who remit the fee due to University (General Category – Rs 953/-, SC/ST candidates – Rs. 50/-) shall be able to download the allotment memo. The allotment memo can be downloaded by clicking on the link “Click here to print your Allotment Memo”and should be produced before the Principal of the College to which the candidate is allotted. . The students should report to the colleges allotted on or before 17/07/2018, 4.30 pm and should produce the following documents for verification. Mark lists of all parts of the Plus Two / equivalent examination. NCC/NSS Certificates in original, if applicable. Community Certificate along with non-creamy layer certificate (as per Government rules) from the revenue authorities concerned in the case of SEBC candidates who claim reservation under SEBC category. The non-creamy layer certificate should not have been issued earlier than 12 months prior to the submission of application. Community Certificate along with the relevant certificate from the revenue authorities concerned to the effect that they come under the Below Poverty Line (BPL) category of forward communities in the case of candidates who wish to avail of reservation under EBFC. All candidates including those who have taken temporary allotment in the previous allotments except SC /ST candidates should take permanent admission on or before 17/07/2018 4.30 pm, else they shall loose the allotment as well as the temporary admission they have secured. Candidates should collect a confirmation slip from the college authorities after reporting for admission and ensure that they have been admitted to the correct category i.e., permanent. Candidates belonging to SC/ST category are allowed to take provisional admission upto the special allotment conducted exclusively for them if they are not allotted on their first option. Those who are allotted on their first option should take permanent admission on or before 17/07/2018 4.30 pm. A candidate is bound to accept an allotment as per the priority of options registered. Failure to report for admission by candidate in the allotted college at the stipulated time and date will result in the forfeiture of his/her chance for admission to that programme/other programmes/further allotment(s). Any request to retain a previous allotment after a further allotment (based on the higher options registered) will not be considered under any circumstances. The allotment is done solely based on the details given by the candidate in online application. Any discrepancy in the online details furnished by the candidates with the original documents submitted at the time of admissions will lead to the cancellation of allotment. Click on MGU Degree 4th Allotment Results 2018. Check the third allotment results.